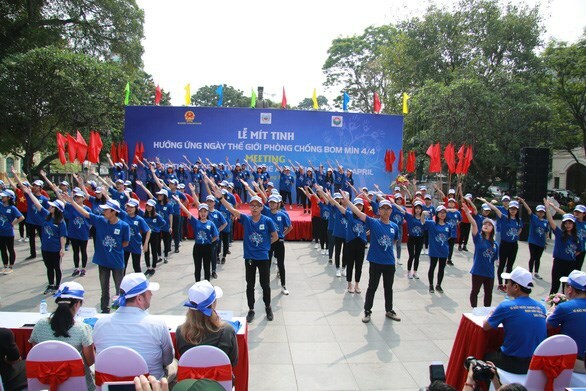 Hanoi (VNA) – A ceremony and a march in response to the International Day for Mine Awareness and Assistance in Mine Action (April 4) will be held in the city of Dong Ha, the central province of Quang Tri on the day, heard a press conference on April 2. The press conference, focusing on efforts in the addressing consequences of post-war unexploded ordnances (UXO) in Vietnam, was held by the Ministry of Labour, Invalids, and Social Affairs (MoLISA) in cooperation with the Ministry of National Defence. Speaking at the event, Chief of the MoLISA Office Nguyen Ba Hoan said that Vietnam may need hundreds of years to fully deal with all its UXOs. The country has accelerated work in heavily-UXO-contaminated localities like Quang Tri, Quang Nam, Binh Dinh, Ha Giang, and Mekong Delta provinces over the years. Meanwhile, Major General Dao Tuan, member of the Vietnam Association for Supporting UXO/ Mine Action Efforts (VNASMA), said the VNASMA has provided support for about 5,000 people in the past four years, mainly those living in remote and mountainous regions. Notably, in 2018, the association launched a set of comic books in Vietnamese and English aiming to raise children’s awareness of UXO accidents in Vietnam. Vietnam is one of the most UXO-contaminated countries in the world. A report on post-war UXO contamination in the country showed that all 63 provinces and cities are still polluted with UXOs. It is estimated that about 800,000 tonnes of UXOs were left across the country after the war ended in 1975, mostly in the central region. Some 6.13 million ha of land are polluted with or suspected of being polluted with UXOs, accounting for more than 18 percent of the country’s total area.